Tuolumne County, just north of Yosemite National Park, is representative of 10 mountain counties in the central and southern Sierra Mountains is facing an extreme wave of bark beetle induced mortality covering both private and National Forest lands. More than 100 million trees are estimated to have died in Sierra Nevada forest since 2011 due to five years of drought and overstocked stands that weakened trees and made them vulnerable to infestation by bark beetles. Dead and dying trees threaten homes, roads, power lines, canals and other infrastructure across the region. As an example of the scale of the effort required to respond to this slow-moving disaster, Tuolumne County responded with one of the most active programs to insure public safety and protect its facilities. The County tree mortality program was recently awarded a 2017 Achievement Award in the category of risk and emergency management by the National Association of Counties, a non-profit organization based in Washington D.C. The county formed a task force to assess and mitigate the crisis, applied for grants, and is using its reserve funds to mitigate the hazards to its facilities. It obtained a state of California grant for the removal of dead & dying trees threatening public facilities which pays for 75% of the cost, but leaves the county to fund the remaining 25%. 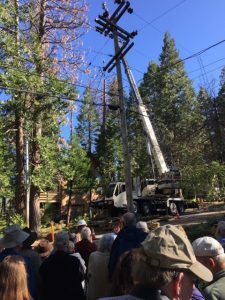 In addition to the county effort, PG&E has removed thousands of trees from along its power lines and utility corridors, often having to use cranes to remove the trees in sections costing $1,000 to $2,000 per tree. 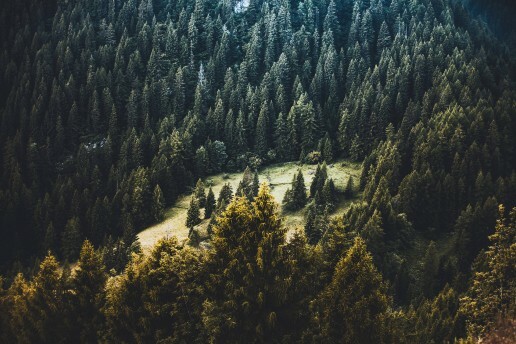 The state of California had had to mount a similar effort to remove hazard trees along state roads in the County, and owners of private industrial land have salvaged thousands of acres of dying trees using several different permits under the California Forest Practice Act. Thousands of private homes and facilities in the counties must remove their dead and dying trees at their own expense if the trees do not threaten a power line or county road and have spent thousands of dollars per parcel. Service clubs including the Lions club of Sonora recognized that elderly citizens on fixed incomes cannot afford the cost of removing hazard trees threatening their homes, and have responded by raising over $100,000 through fundraising and grants. They developed the Tree Mortality Action Program (TMAP) to qualify, locate, measure, and contract the removal of these hazard trees for senior citizens. These trees are also often next to houses with limited access and must be removed in sections. According to the USFWS, the Northern Spotted Owl (NSO) population has declined 52% since 1992. At its current rate of decline, another 25% will be lost in the next 20 years even though the amount of suitable habitat is expected to increase significantly. The cause of the NSO decline is the invasion of the barred owl whose population has exploded since 1990 and continues to increase. 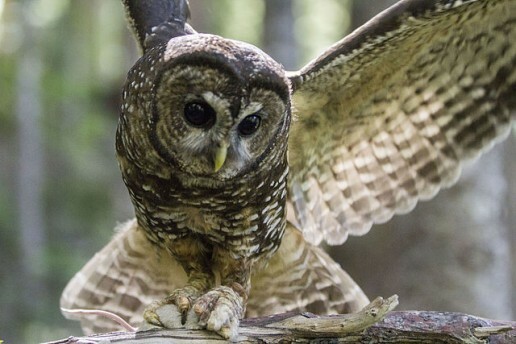 Even though the USFWS only recently formally listed the barred owl as a threat to the NSO, their potential impact has been recognized for almost 40 years. By 2004, the preponderance of evidence led the team conducting a 5‐year status review to conclude “that the barred owl is a significantly greater threat to the spotted owl than originally estimated at the time of listing.” By this time, the overall NSO population had declined by 30% from its 1992 level. In 2008, the USFWS released the NSO Recovery Plan that identified competition from barred owls as a main threat to the spotted owl. Roughly a third of recovery actions address the barred owl threat, including consideration of measures relating to a barred owl removal experiment. By this time, another 8% of the NSO population was lost. In February 2009, a Barred Owl Stakeholders Group was formed as part of the scoping process for the barred owl removal experiment. The final EIS and ROD for this experiment was signed September 2013. By this time another 9% of the NSO population was lost bringing the NSO population down to 54% of its 1992 level. There is no firm schedule for conducting this experiment only that “(R)emoval activities will end when data are sufficient to meet the purpose and need.” A maximum duration of 10 years of barred owl removal was stated for the experiment. At the end of this 10 years, another 13% of the NSO population will be lost. The experimental design called for a total of 3,603 barred owls to be removed from four study areas. After four years, only 978 have been removed. At the current rate, it will take an additional 5 years from what was originally planned where another 7% of the population will be lost. After the experiment is completed (sometime after 2027), if they find that removing barred owls leads to an increase in NSO’s which is likely, the USFWS will then have to go through a lengthy regulatory and legal process to develop a barred owl removal plan. This could take yet another 10 years at which time the NSO population will only be at about 25% of its 1992 level and perhaps will be extirpated from major portions of its range. The adoption of a plan, however, does not mean the plan will actually be implemented. To implement the plan, it will have to withstand lengthy legal challenges from opposing environmental groups and if successful, convince Congress to allocate millions of dollars every year to carry out the plan. In the 20-30 years it will take to maybe start barred owl removal, the spotted owl will have already become extinct throughout much of its range. In the meantime, the USFWS is focusing on maintaining and increasing suitable NSO habitat claiming that since the NSO population is declining so rapidly “habitat is more important than ever.” The fallacy of this concept is that there are already hundreds of thousands of suitable NSO habitat that is devoid of any NSO’s because of the presence of barred owls. Any new habitat that is created will be occupied by barred owls and therefore of no use to the NSO. The result of this fixation on “habitat” as opposed to addressing the real problem is that the much needed fuels reduction and restoration work needed on our federal lands is being thwarted by the USFWS insistence on maintaining all of the existing nesting habitat and major reluctance to allow treatment of foraging and dispersal habitat. It is understandable that the USFWS is reluctant to address the real threat to the NSO as killing barred owls at the level that would make a difference to the NSO will be met with major resistance from environmental groups and Congress is not likely to continually fund a multi-million dollar removal effort. The Endangered Species Act (ESA) states that it is unlawful to “take” any endangered species of fish or wildlife. 50 CFR Part 17.31 expands the prohibition to take endangered species to wildlife species listed as threatened. The term “take” means to harass, harm, pursue, hunt, shoot, wound, kill, trap, capture, or collect, or to attempt to engage in any such conduct. Harm is further defined in 50 CFR §17.3 to include significant habitat modification or degradation that results in death or injury to listed species by significantly impairing behavioral patterns such as breeding, feeding, or sheltering. Harass is defined as actions that create the likelihood of injury to listed species to such an extent as to significantly disrupt normal behavior patterns which include, but are not limited to, breeding, feeding or sheltering. All of the “takings” alleged to have occurred due to habitat modification caused by timber sales on federal land are in the form of harassment. The Secretary is also authorized by the ESA to permit any taking if such taking is incidental to, and not the purpose of, the carrying out of an otherwise lawful activity. The USFWS issued “Procedures Leading to Endangered Species Act Compliance for the Northern Spotted Owl” in July of 1990. This document defined how take would be determined when associated with “degradation or the destruction of suitable spotted owl habitat”. These guidelines were established based on limited research done in the 1980’s that showed a tenuous relationship between the amount of suitable habitat and spotted owl occupancy and reproductive success. Based on this limited research, the USFWS determined that there is a high likelihood of take if the amount of suitable habitat within the home range falls below 40%. The actual research this was based on showed that stands over 21% suitable habitat functioned as well as those with greater amounts of habitat. (Bart, J and E.D. Forsman 1992) The USFWS formally rescinded the take guidelines in October 1991 but has continued to use the 40% standard as ‘the best scientific information”. As a result of a ruling in a case called ONRC vs. Allen. The USFWS, USFS and BLM developed the Owl Estimation Methodology (OEM) which updated the habitat conditions that would determine the likelihood of take. They retained the 40% of the home range determination and modified the threshold conditions within the nest site and core areas. 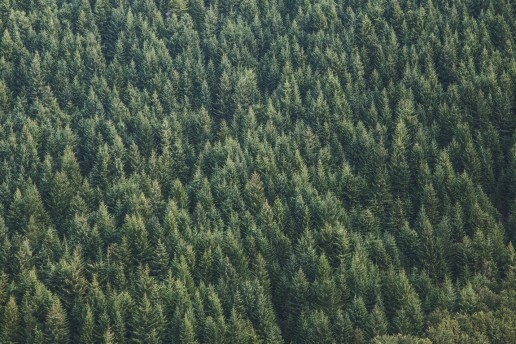 The OEM also defined that a take would occur if any suitable habitat is removed within a 300 foot radius circle around the nest tree or the amount of suitable habitat falls below 50% of the core area which range in size from 5,720 acres in northern Washington to 500 acres in Oregon and California. The OEM was formally withdrawn in 2015 after Judge Leon ruled its use by the federal agencies was illegal but the USFWS still utilizes the three habitat criteria to determine if owls will be “taken” due to changes in suitable habitat conditions. When a timber sale is being planned, the action agency (USFS or BLM) must determine how it will affect the spotted owl. There are three affect determinations. The first is that the project will have no effect in which case the action agency does not have to notify the USFWS about the project. The second is a “may affect but not likely to adversely affect” the spotted owl. In this case, the action agency must obtain a “letter of concurrence” from the USFWS. The third determination is one that “may affect and is likely to adversely affect” the spotted owl. Currently, the USFS and BLM have been directed by the USFWS to treat projects that remove or downgrade any suitable spotted owl habitat regardless of the presence of any spotted owls as being “likely to adversely affect” spotted owls. In this case, the action agency submits a Biological Assessment to the USFWS who then prepare a Biological Opinion that must conclude that the proposed actions will not “jeopardized the existence of the specie” or “adversely modify critical habitat”. If either of these occur as a result of the project, the project will not go forward. If the project receives a no jeopardy and no adverse modification determination, the USFWS then determines if any take will occur as a result of the project. If so, they will prepare an incidental take statement which allows the agency to proceed with the project since the take “is incidental to, and not the purpose of, the carrying out of an otherwise lawful activity”. In determining take, the USFWS uses the take guidelines found in the Owl Estimation Methodology. The amount of take that is assumed to occur if habitat is below one of the three thresholds is 2 adults and 1.5 young per home range. Using hard line thresholds for take determination leads to a number of very bizarre situations. The first of these occur in southern and eastern Oregon and northern California. In these provinces, over 90% of the historic home ranges do not contain 40% suitable habitat in their natural state. This is due to climate and soil productivity factors that limit stand density. It also frequently occurs on land managed by the BLM because of their checkerboard ownership created by the O&C Act. Since the home ranges in these areas are below threshold levels naturally, removing any “suitable habitat” will result in a take determination of 3.5 owls. This determination will be made regardless of the known presence of any spotted owls. If even a small amount of suitable habitat is removed a short time later in another project, another 3.5 owls will be said to be taken. This could go on ad infinitum leading to the ridiculous conclusion that hundreds of owls could be “taken” from a single home range even if no owls were using the area. Because the take determination for timber sales rely on the prohibition of harassment, the USFWS should be determining if the proposed action will “create the likelihood of injury to listed species to such an extent as to significantly disrupt normal behavior patterns”. Since they do not do this and rely on the three hard line thresholds, a take would not occur if a home range currently had 41% habitat and would be reduced to 40% by a project yet a take would occur if a home range had 40% suitable habitat and a project would reduce it to 39%. The same would occur concerning the 50% threshold for the core area. The BLM recently adopted new Resource Management Plans (RMP’s) for the lands they manage in western Oregon. Due to the precipitous decline in the spotted owl population being caused by the barred owl, the BLM agreed to not “take” any spotted owl until the USFWS adopts a barred owl management plan. If this plan is not done in seven years, the BLM will have to re-consult with the USFWS on their RMP’s causing major disruptions to their land management and perhaps triggering revisions of the RMP’s. There is zero probability that the USFWS will adopt a barred owl management plan in seven years and it is not likely to occur in the next 20 years if ever. It should be noted that the USFWS has determined that without a drastic reduction in the size of the barred owl population, the spotted owl will become extinct in most of its range regardless of how much habitat is protected or created. They recognize the importance of reducing the size of the barred owl population and realize the only mechanism to do this is by lethally removing them. They therefore embarked on a research project to determine the effectiveness of lethal removal. This study stared in 2013 and was to remove a total of 3,603 barred owls from four areas within four years. This effort is going much more slowly than expected. Between 2013 and 2017, only 819 barred owls have been removed. Even if the rate of removal doubled, it will take another six years to complete the field work. This will be followed by 10-15 years of analysis, development of a plan, environmental analysis of the plan and public involvement. In the best case scenario, a plan may be adopted in 20 years.